We are drawing towards the close of the First World War centenary. This November there will be lots of stories in the media about that period. We wanted to get some of our coverage done early – partly before you all get bogged down with an overload, but also to highlight that even though there have been four years of coverage, many stories have not been told. The war transformed British and European societies, Empires ended and historic nation states remerged. Technology advanced in ways no one could have contemplated in 1914 and attitudes and social norms were challenged. Millions were killed or injured and new understanding of the horrors of war was brought home to men and women across the globe. The concept of the noble sacrifice and the glory of war was changed forever. 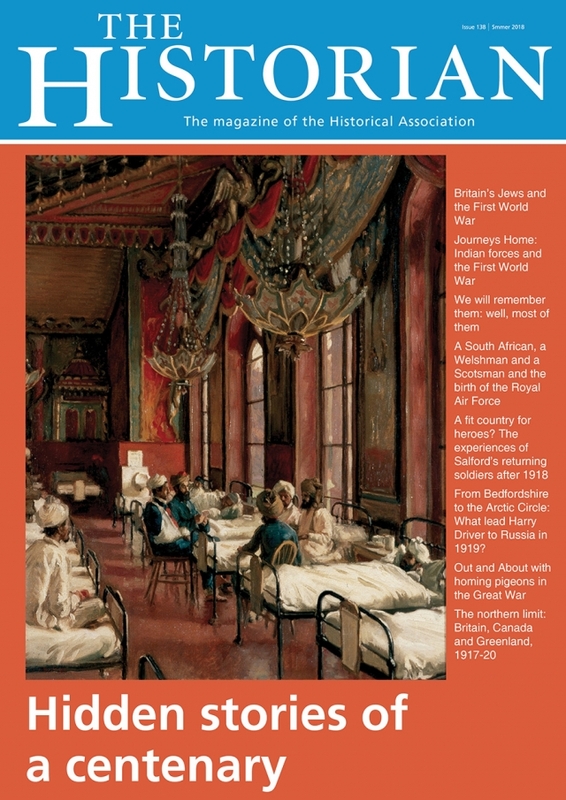 In this edition we wanted to present some of the stories perhaps overlooked in the grand narratives of the First World War and tell the stories of the men and women who were not always the ‘typical’ tommy. It is a reminder that the theatres of fighting stretched far and wide and that those who contributed to a shared experience came from many different backgrounds. We hope that all of their names endure to remind us of the complexity of conflict and the impact it has on ordinary lives. My colleague, Paula Kitching, has outlined in her editorial comments her perspective on our coverage of the First World War centenary. She understates her role in our coverage: for just over four years she has led our efforts to provide a wider understanding of the fullest parameters and implications of what that war meant for Britain and its Allies, ranging from the technical to the social and economic. What she has revealed in this continuing series of articles, and culminating with this edition of The Historian, is the fact that history has so many dimensions and nuances. It reminds me of what the late Professor W.G. Hoskins once said to me: history is not interdisciplinary or indeed multi-disciplinary but by our very actions many of us function in partnership with other disciplines. In thanking Paula for what she has achieved for us, we must remember and recognise that she is also one of the leading figures in the Historical Association’s involvement with ‘The RAF at 100’ curriculum initiative where we are working with the RAF100 Schools Project and the Institute of Physics. At our recent Stratford Conference, BBC History Magazine distributed a special edition to celebrate this initiative and its intentions. It is clear that success for an organisation like the Historical Association in the future may well be more forthcoming with collaboration and partnership. The recently announced ‘Women’s Suffrage: history and citizenship resources for schools’ is another feature of this pathway. It involves the Historical Association working with the Association for Citizenship Teaching to explore the emergence of women’s suffrage. Long-term subscribers to The Historian will remember that we engaged with this topic a few years ago with an article by Sarah Richardson entitled ‘Petticoat Politicians: women and the politics of the parish in England’ (The Historian, Autumn 2013, pp. 12-15). What I want to convey to you most strongly is that the Historical Association continues to be a vibrant, forward-looking organisation. It succeeds in marrying its dual commitment to promote and celebrate a general interest in history among its members, while at the same time making memorable and marked contributions to advances in historical scholarship, both in terms of research and teaching methods.